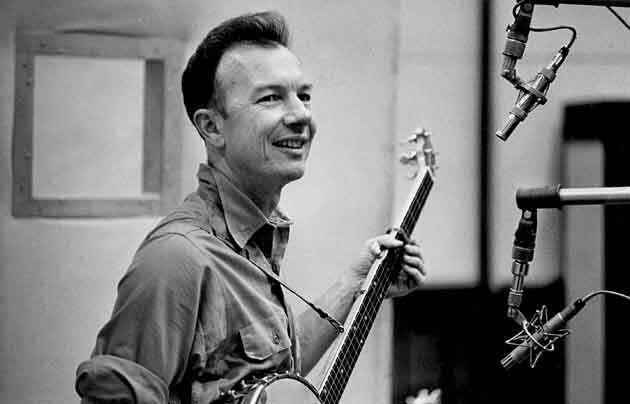 For Pete Seeger, communist militant, first in the Party, and then beyond it, singer and story teller of America’s working classes and poor, co-founder of The Almanac Singers, and later The Weavers, who passed away on the 27th of January, at the age of 94. If it can’t be reduced, reused, repaired, rebuilt, refurbished, refinished, resold, recycled or composted, then it should be restricted, redesigned or removed from production. Well, normally I’m against big things. I think the world is going to be saved by millions of small things. Too many things can go wrong when they get big. Once upon a time, wasn’t singing a part of everyday life as much as talking, physical exercise, and religion? Our distant ancestors, wherever they were in this world, sang while pounding grain, paddling canoes, or walking long journeys. Can we begin to make our lives once more all of a piece? Finding the right songs and singing them over and over is a way to start. And when one person taps out a beat, while another leads into the melody, or when three people discover a harmony they never knew existed, or a crowd joins in on a chorus as though to raise the ceiling a few feet higher, then they also know there is hope for the world. This entry was posted in News blog, Poiesis and tagged Art and Revolution, folk music, Pete Seeger. Bookmark the permalink.